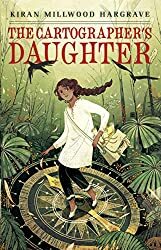 I read this as The Girl of Ink and Stars, got to the acknowledgements page and saw the author thanking Victo Ngai for the cover art, and was briefly very confused (I’m sure I can recognise Ngai’s art when I see it)–but it’s here, on the US edition of the book, titled The Cartographer’s Daughter. I’m not enamoured by either title–the UK one is a bit too twee, and the US one too much in the Man-With-Job’s Female Relation pattern: though that is a scheme I associate with tastefully muted dramas rather than children’s adventure stories. The cartographer in question is absent for much of this particular story, and Isabella is only really defined by that relationship insofar as she too is good at (and passionate about) maps. The plot: Isabella lives on a corner of the island of Joya, run by a dictatorial local governor. Much of the island has been cut off–there’s a forest around the village of Gromera, and beyond it live The Banished. We’re told very little about how this state of affairs came into being, and none of the adult characters seems to have been around when it happened. (This gives an impression that things have been this way for much longer than the later events of the book would suggest, but I’ll come back to that.) Isabella’s best friend is Lupe, the Governor’s daughter who somehow manages to ignore the oppressive nature of her dad’s society and the literal prison literally under her house. Until she sends a servant (Cata, a girl who goes to school with Lupe and Isabella) into the orchard to get her some fruit–and the girl’s mangled body is found the next day. Finally aware of some of the horrors of the world in which she lives, and of her own complicity in them, Lupe runs away, into the forbidden parts of the island, to find the creature/s that killed Cata, and her father, Isabella (disguised as her own brother, Gabo), and a group of men must go after her. Reading fantasy, one is often placed in a position of working out how reality functions in this new setting–what is and is not plausible, how myths have developed (or how they are supposed to have developed, since the world is a construct), the relationship between fantasy, myth, history, magic, etc. in this world. Interspersed with the current-day plot of The Girl of Ink and Stars are stories of the island’s past, told to Isabella by her father: stories of the time when the island floated free across the waves, stories of her grandfather and his ship of glowing wood, and of the island’s legendary heroine, Arinta, who saved the island from a fire demon who wished to consume it, but was lost in an underground labyrinth, chased by the fire demon’s demonic dogs. It’s clear that these fantastical stories, dismissed by Isabella’s friends, are going to have something to do with the mystery of Cata’s death (that there are claw marks around her body is something of a clue), but we’re still expecting to have to puzzle this out; still expecting that if Joya’s mythic past is in some sense true, it’s the truth told slant. The early sections of the book work well. The island setting feels a bit generic, but the governor’s power and the powerlessness of the people Isabella knows, the bewilderment of Isabella and Lupe at a curfew that no one is willing to explain to them, the simmering resentment of Gromera’s inhabitants and the sense that it’s all about to come to a head, all these feel right to me. It’s the point at which Isabella leaves Gromera and begins to explore the interior of the island, as well as its history, where to me it begins to feel disappointing. We travel through burnt forests, waterfalls with hidden caves behind them, deserted villages, underground labyrinths filled with fire, heat enough to turn the sand of the beach above into a river of glass, and somehow none of these are memorable. It’s doubly disappointing because The Girl of Ink and Stars is such a slight book, and these images, had they been half as evocative as they ought to (how do you make liquid glass dull? *) might themselves have been reason enough to read it. I wondered, briefly, how it was possible for so much information about the rest of the island to be lost in what can’t have been that great a stretch of time (I’m hazy on time and history in this book/on Joya), and then remembered how many illustrations of just this we’ve been able to witness in the recent past. I wondered how Isabella’s mother had come into possession of a map that also showed, when soaked with the right sort of water**, a detailed plan of an underground labyrinth that had apparently only ever been entered by a mythical hero who never returned. I had several questions, but didn’t particularly mind their lack of answers. I said, above, that we’re expecting the truth told slant; that the myth is true, but true in the way that myths are; that Arinta did save the island, from a demon or from a natural phenomenon, but that the myth is the distilled form. It is not. Isabella and Lupe follow her underground, confront the creatures below, use the sword Arinta left down there to vanquish the demon. It’s hard to understand how mythic knowledge can be dismissed by the characters in this world when it’s more accurate, at the most mundane level, than even Gromera’s understanding of its recent past. We even discover that the story that the island was once free-floating is true–at the end, it’s on its way to “Amrica”. I should be charmed, but I’m not. ** In a thesis chapter on The Hobbit, I have a section on the map in that book, and the fact that it has on it hidden information that can only be read in the moonlight on one day of the year, and what this might say about mapping and knowledge and adventure stories and space. Some of that probably applies here, somehow.